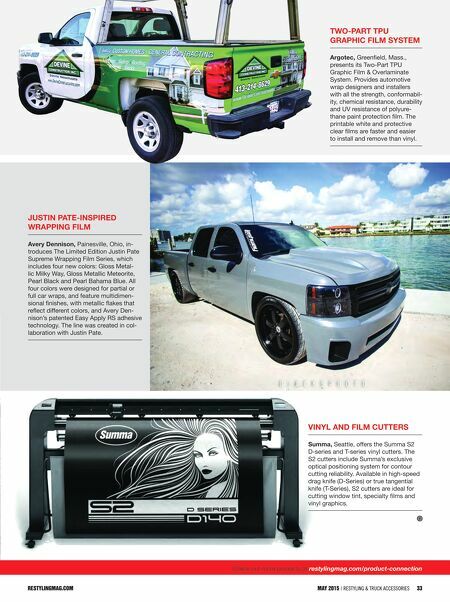 restylingmag.com May 2015 | Restyling & tRuck AccessoRies 33 restylingMag.coM May 2015 | Restyling & tRuck AccessoRies 33 Check out more products at restylingmag.com/product-connection Two-ParT TPU GraPhic Film SySTem argotec, Greenfield, Mass., presents its Two-Part TPU Graphic Film & Overlaminate System. Provides automotive wrap designers and installers with all the strength, conformabil- ity, chemical resistance, durability and UV resistance of polyure- thane paint protection film. The printable white and protective clear films are faster and easier to install and remove than vinyl. 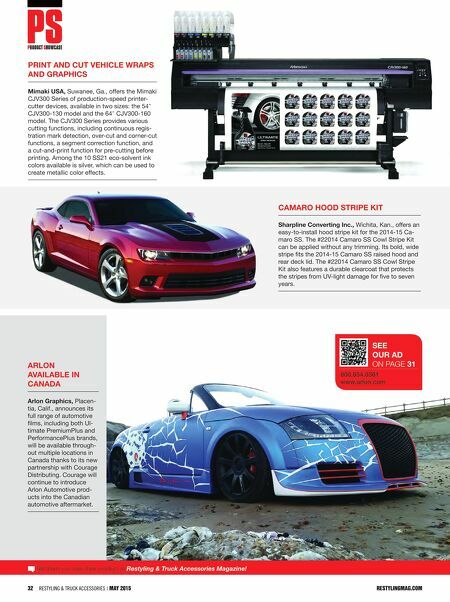 ViNyl aND Film cUTTerS Summa, Seattle, offers the Summa S2 D-series and T-series vinyl cutters. The S2 cutters include Summa's exclusive optical positioning system for contour cutting reliability. Available in high-speed drag knife (D-Series) or true tangential knife (T-Series), S2 cutters are ideal for cutting window tint, specialty films and vinyl graphics. JUSTiN PaTe-iNSPireD wraPPiNG Film avery Dennison, Painesville, Ohio, in- troduces The Limited Edition Justin Pate Supreme Wrapping Film Series, which includes four new colors: Gloss Metal- lic Milky Way, Gloss Metallic Meteorite, Pearl Black and Pearl Bahama Blue. All four colors were designed for partial or full car wraps, and feature multidimen- sional finishes, with metallic flakes that reflect different colors, and Avery Den- nison's patented Easy Apply RS adhesive technology. The line was created in col- laboration with Justin Pate.